I absolutely love a good strawberry. And for that reason, I can hardly look at a strawberry throughout the winter. They don’t taste even remotely like the fruit I love. So when fresh local strawberries start popping up, you can imagine my excitement. This weekend my CSA gifted me with pretty little strawberries bursting with flavor and my wheels began spinning. In truth, most of the time I enjoy these red beauties just as they are, no “recipe” necessary. But for times when I’m looking to give them a bit of a dressing up, this buttery ricotta cake is the perfect platter on which to serve them. The berries themselves I simply toss in a little honey and sprinkle with fragrant thyme. Preheat the oven to 350°F. Lightly grease an 8-inch round cake pan and line the bottom with parchment paper. In the bowl of an electric mixer fitted with the paddle attachment, cream together the butter and sugar until light and fluffy. Add the ricotta, egg yolks, lemon juice, and zest and mix until well combined. Add the flour, baking powder, and salt and mix just until combined. In a separate bowl of an electric mixer fitted with the whisk attachment, whisk the egg whites until soft peaks form. Using a rubber spatula, gently fold the egg whites into the ricotta mixture until incorporated. Pour the batter into the prepared cake pan and bake for about 40 minutes, until the cake begins to pull away from the sides, the center is just set, and a skewer inserted into the center of the cake comes out clean. Meanwhile, to prepare the strawberries: Place the berries in a large bowl. In a small saucepan, heat the honey over low heat until melted. Remove from the heat and stir through the thyme. Pour over the berries and toss gently to coat. Let the cake cool in the pan for 10 minutes then turn out onto a wire rack. Flip onto another wire rack so that the top of the cake is facing up and cool to room temperature before slicing. Serve slices topped with honeyed berries. 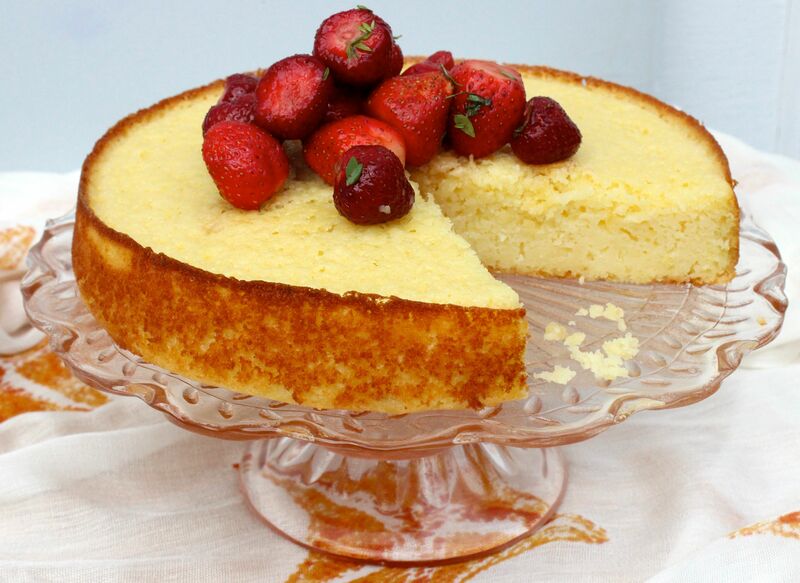 This entry was posted in dessert and tagged cake, dessert, honey, ricotta, strawberries. Bookmark the permalink.